We are all so used to seeing the copyright symbol that we don't even really pay attention to it any more. However, being aware of what copyright is and how it affects us as educators is critical. Not to mention it is the law and infringement against copyright can lead to criminal charges. Copyright is a form of legal protection that is provided by law (through the government) to authors of "original works of authorship, including literary, dramatic, musical, artistic, and certain other intellectual works." This protection covers both published and unpublished works. Copyright protection beings as soon as a work is created in a fixed, tangible form of expression. At this point, the author is immediately becomes the holder of the copyright for the created work. Copyright protection and the way it is secured is often misunderstood. Copyright is secured automatically when the work is created in its fixed and tangible form. Example: You create an instructional video for a class or you write a poem. The misunderstood part of copyright is that publication nor registration with the Copyright Office is required to secure copyright, although it is recommended. 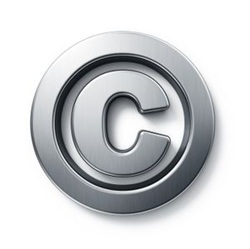 In fact, use of the copyright symbol is not required under current U.S. law. It is, however, beneficial if for no other reason that it reminds people that the work is protected by copyright. Use of the copyright notice (symbol) can be done freely without permission from the U.S. Copyright Office. Duration of copyright varies, but a good rule of thumb is that: "a work created on or after January 1, 1978, is automatically protected from the moment of its creation and is ordinarily given a term enduring for the author's life plus 70 years after the author's death."